The key to wedding receptions is to book early. Sounds simple doesn't it? To make it simpler, book the wedding venue a year in advance. Make a deposit or down payment, take hostages if you have to but don't miss out on the venue you want. Some extremely popular receptions are booked so far ahead, you've barely reached puberty when the deposit is paid. I'm joking, but you get the picture. Anyway, who wants to wait that long to get married. Nevertheless, it pays to plan ahead. Wedding Theme: Firstly, have a very clear idea on the style of wedding you want; traditional, formal, semi-formal or casual. Choosing a wedding theme or colour theme will be an important decision in regards to planning the reception, as this can dictate the wedding reception location and the type of venue you'll choose to have your party at. There's definately a demand for new and creative wedding ideas, newly weds are more open to new and innovative ways to celebrate their wedding day. Creative red & white wedding napkins decor. Floral centerpiece as wedding table decorations. 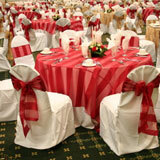 Red & white chair covers and tablecloths. 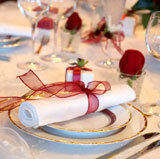 The theme of your wedding ceremony and reception dinner should be congruous. If it's a formal service, it is generally followed by a sit-down dinner interspersed with speeches, the bridal waltz and the cutting of the wedding cake. If it's an Elvis impersonator ceremony, don't step on the groom's Blue Suede Shoes, treat him nice or he may get the GI Blues. There are so many reception ideas to choose from, so it's no wonder brides are looking through books and magazines for guidance, though with the internet information superhighways helpful suggestions are never far away. Deciding where you celebrate your wedding event can be a breeze, but you need to keep it simple by following a pre-reception-booking checklist. • Decide on the style of wedding you want - formal, semi-formal or casual. • Choose a wedding theme or colour theme, as this will carry through to all you wedding decorations, bouquets and bridesmaids dreses. • Glean through wedding directories and bridal magazines for advertised receptions and venues. Also remember to ask friends and family for recommendations. • Call and visit the venues and ask questions relating to you needs and wants. • Pick a venue and give them a holding deposit, ask for a copy of the contract confirming all the reception details and finalise the food menu and wine list..
• Organise entertainment and any necessary wedding decorations. Unless they are already included in your package. • Make sure you've collected all your guest's RSVP's, and organise the reception seating plan. • Put together a wedding reception program including speeches, cake-cutting and the bridal dance. Make copies for the reception manager, the DJ, Master of Ceremonies and of course yourself. For your interest; here's a detailed wedding reception order of events to give you an overview of what to expect. You may also be interested in this comprehensive step by step wedding reception emcee sample script for those of you that have been given the task of the wedding MC for the reception. • Pay the rest of the money owed for the wedding reception, confirm all details with wedding chair decorators etc. Is the reception or wedding venue available on the wedding day? Do they cater for day time, afternoon and/or night time weddings? Do they have all the amenities that you require to have your dream wedding? Or do you have to compromise your wedding plans in order to have your wedding there? Does the reception or restaurant have a change room or resting place facility for the bridal party? If not, you may need to hire a small out door tent. Is there sufficient space or Room for a band, DJ and/or dance floor? Is there a lovely outdoor garden or pagolla near by? The perfect prop or backdrop for your wedding photo's etc. Do they have adequate parking facilities for all of your guests? Can they accomodate for a large wedding guest list? How much do they charge for children's meals? The price for a child's plate at a wedding is usually 45% less than adult meals. Do they cater for small weddings, if so, what is their minimum head count? When is comes to decorating receptions - especially your own - is one of life's rare joys. The opportunity to truly expess yourself on a stage of your own making. Wedding themes and colour schemes are the broad canvas for your wedding decorating ideas, and gorgeous floral displays and clever use of candles remain the mainstays of wedding reception displays. Table decorations are the flourish of colour that transform a humble reception into a night to remember. The colour and spice of a gorgeous wedding table setting are the hallmark of a truly memorable event and a signal to your friends and families that on this night, this is a magical place. 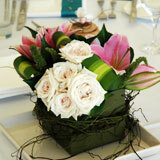 Wedding table design requires a little skill, coordination and some knowlegde of colour. Some of these reception ideas have just got to inspire you to great things. The key to decorating for wedding receptions is picking a colour and/or theme and sticking to it. Whether you go for traditional weddings reception decorations or are looking for some really unique ideas for a wedding reception, these wedding reception pictures demonstrate some of the wonderful things you can achieve with colour and lighting. A clever use of napkins can play a part in the wedding table design. It could just be in the way the napkin is folded or your choice of colour. Napkins also serve as great wedding table decor, a vital feature of a wedding reception.There are many ways to display napkins and uniquely decorate a table setting. You can also match them up with table runners and place mats. Chair decorations create an elegant atmosphere and are one of the most perfect wedding decorating ideas, wedding chair sashes and bows, just add to the finishing touch.Wedding chair covers come in all sorts of fabrics and textures, like satin, organza, damask, pinktuck, check, embroidery, prints, crushed satin, lace etc, depending on the rental company. Table runners can serve as fine decorative idea for a reception. Just the use of colourful elegant table runners alone can lift a wedding reception, even from a distance.Less need for fussing with other wedding table decor. You could have beaded table runners, organza table runners or a combination of satin and linen fabrics. It is up to your imagination and your wedding theme! Reception decorations are the finishing touch that will set your party from the rest. When decorating for wedding receptions (especially your own) don't just think big, think big picture. Decorating for a wedding reception, is almost like detective work finding those perfect chair covers or the special napkin rings you found on E-bay.